Of the 24 charter yachts registered for the show, 18 were new to the event and 13 measured in at 100 feet and longer. Over 45 crew from 15 boats participated in the competitions. The Newport Charter Yacht Show was staged at the mega-yacht friendly Newport Shipyard, which also owns and operates the event. First up on Tuesday afternoon (June 19) was the Chef’s Competition, this year with a new theme of desserts (with an eye toward specialty diets). 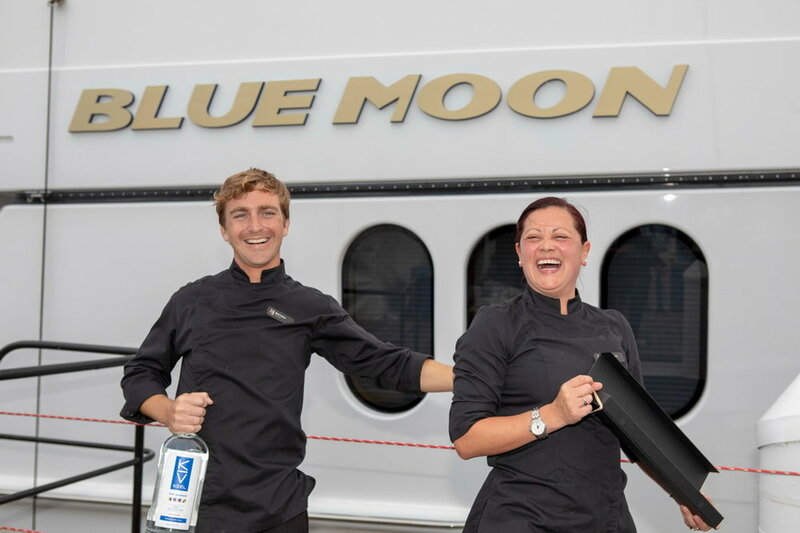 Topping the eight entries was Head Chef Carolina Velandia of the 198’ Motor Yacht Blue Moon with her Picante São Tomé Chocolate Tofu Mousse. The plated dish, both lactose and gluten free, perfectly blended chocolate with spices and included passion fruit curd on the side and a sprinkling of Moscato jelly cubes. Velandia was assisted by her Sous Chef Rhett Sauers. Only two points separated first and second and half a point separated second from third in the Chef’s Competition. Runner-up Chef Terry Gatewood of the 123’ Motor Yacht Temptation explained to the judges that his elegantly understated Lemon Blueberry Posset was a food remedy and sleep aid in the 15th Century. 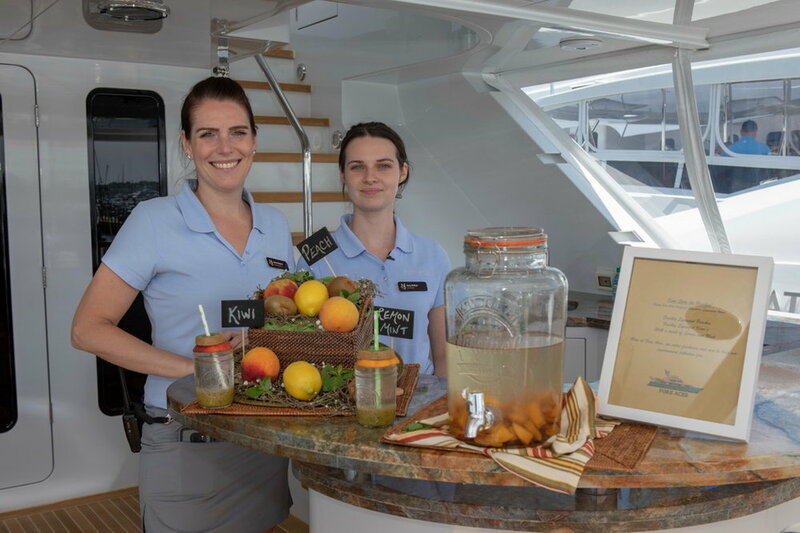 Third-place finisher Chef Gaylinn Fast said her yacht, the 120’ Motor Yacht Lady Victoria, was next headed to Maine for a charter, and she wanted to honor that with her “Acadian Woodland Trail” presentation. Served in a brandy snifter, her dessert simulated a terrarium, complete with a yogurt panna cotta base, chocolate biscotti “dirt”, green snickerdoodle “moss” and merengue “mushrooms”. The chefs prepared their desserts in their own galleys and then plated them before the judges in the main show tent. 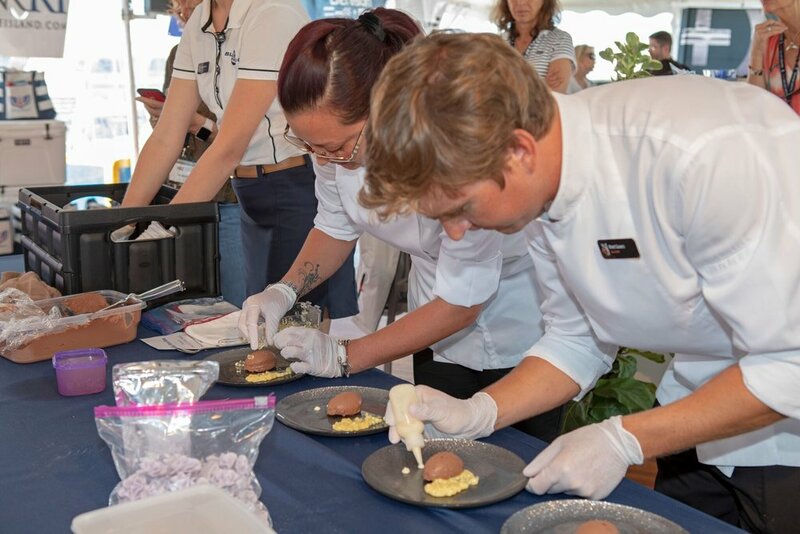 The judges were Viveré Chocolate’s Robert Bowden (who supplied three varieties of chocolate for optional use in the recipes), Food Network personality Kevin Des Chenes, Superyacht Association President Kitty McGowan, and Newport Exhibition Group Executive Liz Nittmann. Judging criteria was based 40% on taste, 35% on presentation, 15% on creativity/originality, 5% on incorporation of special dietary restrictions, and 5% on table presentation. 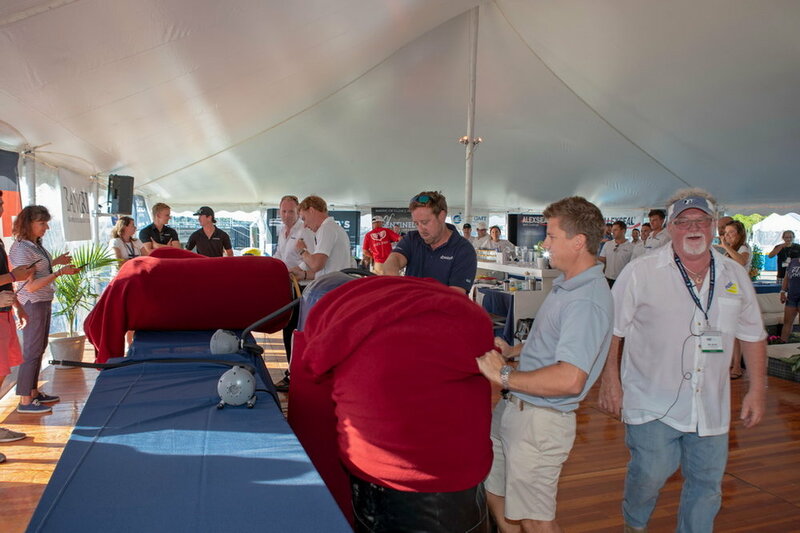 On Tuesday evening, the Captains’ Competitions elicited howls of laughter from a large audience gathered under the show tent to see Captains (or their crew representatives) race to inflate and cover a megayacht fender the fastest; create a floral design (judged by stewards and stewardesses); and pilot a mini drone to land closest to a bullseye on a target placed 25 feet in the distance. After cumulative scoring in the three events, deck hand Andre van der Linde from M/Y Serque walked away with the first prize, while crew member Dustin Grove from M/Y Domani took second and Captain Brandon Freeland from M/Y Enterprise finished third. Van der Linde said he approached the contests like his crew approaches the treatment of charter guests: “We don’t skimp on anything!” Aside from his winning flower arrangement and second-best performance at fender filling, he was the only contestant to land on the bullseye with the drone. Onboard crew contests were held throughout the day on Wednesday (June 20). 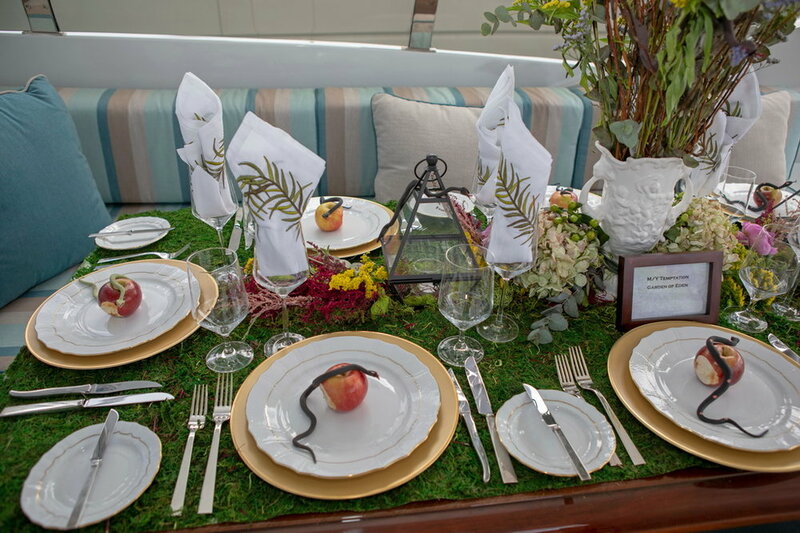 Tablescaping had two judging categories and M/Y Temptation won Judge’s Favorite with an appropriately-themed Garden of Eden setting, complete with serpents encircling partially eaten apples. Fan Favorite in Tablescaping was M/Y Four Aces and its setup for an elegant evening party with crystal, candles and silver accents. Four Aces also won the Specialty Cocktail Competition (sponsored by and using Keel Vodka) with a concoction named “Ginger’s Pickling Peaches”. It included gin, elderflower syrup, peach schnapps, lime, peach cooler water, and chili syrup, and was garnished with peaches, edible orchids and cotton candy. Second and third, respectively, were M/Y Hoya Saxa, with its tropical tiki-inspired drink with strawberry, pineapple, and orange juices as well as mint and ginger, and S/Y Marae with its “Violet Limoncello Lemonade”, made with grapefruit juice, Pellegrino, fresh lemon and a pea flower ice cube that changed color from dark blue to violet upon melting. For its third victory, Four Aces won the Designer Water Competition, which challenged the crews to create a flavored “spa” water using water from their onboard system. M/V Serque and M/V Hospitality finished second and third, respectively. While not officially part of the crew competitions, the Yacht Hop on Wednesday night was another chance for crews to shine and show off their skills. Most impressive were M/Y Domani with its “Under the Big Top” circus theme celebration and M/Y MB III and M/Y Serque’s tandem “Super Hero” party. 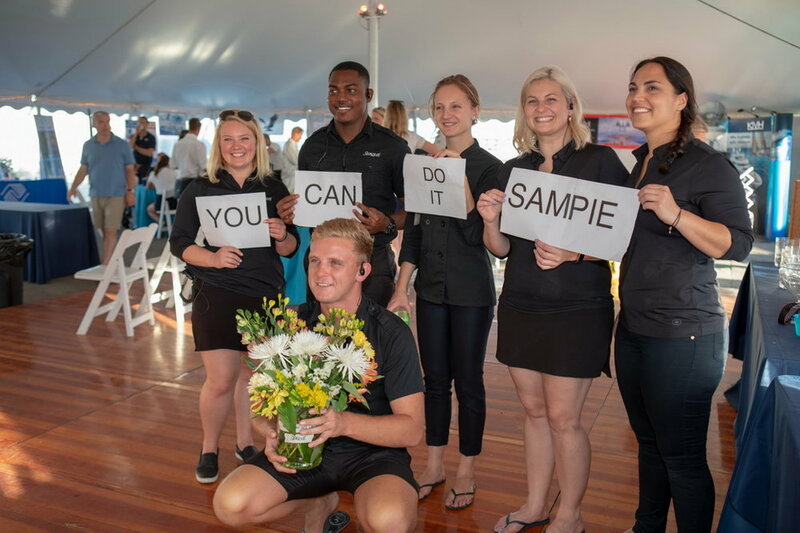 The Crew Competitions were organized by Winnie DeCoster of The Captain’s Concierge and sponsored by ISS GMT Global Marine Travel, Sentinel Limousine, and Denison Yacht Sales; also organizing the Captains' Competitions wereCloud City Drones and Aere Marine. Thursday evening’s party and awards dinner was sponsored by Ward’s Marine Electric and KVH Industries. 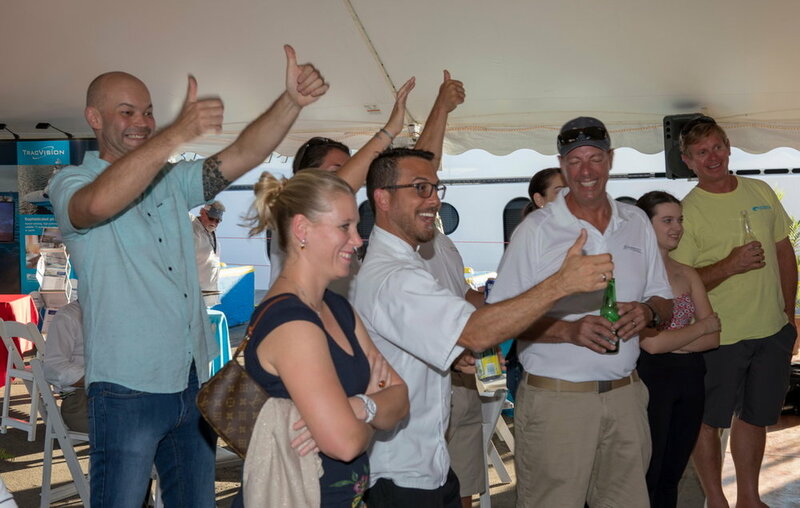 Special events started with a captain and crew’s briefing and happy-hour social on Monday sponsored by Sea Hawk Paints andAlexseal Yacht Coatings. Drinks for the briefing were sponsored by Bridge Liquors. Bank Rhode Island sponsored a daily breakfast under the main show tent catered by Newport Shipyard’s popular eatery Belle's Café. Tuesday and Wednesday’s Chef’s Competition, Captains’ Competitions and onboard Crew Competitions were sponsored by ISS GMT, Denison Yacht Sales, and Sentinel Limousine, while an industry-led educational seminar was hosted by American Yacht Charter Associationon Thursday morning. Thursday evening’s party and awards dinner, sponsored by Ward’s Marine Electric and KVH Industries, topped off the social events before the show’s final day on Friday. Newport Shipyard, owner and producer of the 2018 Newport Charter Yacht Show presented by Helly Hansen Newport, is also host to many other prestigious yachting events. 2018 is no exception with the Gosling’s Rum Newport Shipyard Crew Party for the Newport to Bermuda Race (June 13); the annual Candy Store Cup Superyacht Regatta (July 26-28); and the Newport Yacht Rendezvous benefitting the Boys & Girls Club of Newport County (August 10).